Unwanted hair can be very unpleasant for all kinds of people. Generally, it can cause low self-esteem, a reduction in confidence and embarrassment. Our aim at Clear Medical is to provide an effective and efficient solution. Medical grade IPL Laser hair removal will remove those unwanted hairs permanently. There are many different types of hair removal methods on the market. Please see Alternative Hair Removal Methods for more information. Here we provide you with general information that may help you decide if this is something you want to consider. You may not realise that laser hair removal originated surprisingly from tattoo removal. Scientists involved in this field stumbled upon the treatment whilst removing a tattoo. The discovery illustrated that targeting a brown protein – with similar characteristics to the one found in hair, no hair grows back. Therefore, leading to the accidental beginning of laser hair removal! There has been great innovation in the production of lasers which are available today. Firstly, initial lasers were very simple and basic; they only worked on a single pulse and wavelength. This meant they were not safe to use on individuals with different skin colours and sensitivities. However, due to technological advancements, specific tailoring of lasers is accomplishable. It is now possible to use lasers on different wavelengths, intensities and pulses for skin treatments specific to the individual. Laser manufacturers also vary and since 2006 we are proud to have used one of the best medical aesthetic manufacturers Lynton Lasers. Laser hair removal targets melanin. This is a brown protein present in dark hair. Some hair types do not contain melanin, therefore it’s not possible to treat blonde, white or red hairs. Due to the fact a property of the melanin protein is its colour, it can absorb light, which is what allows the laser to work so effectively. 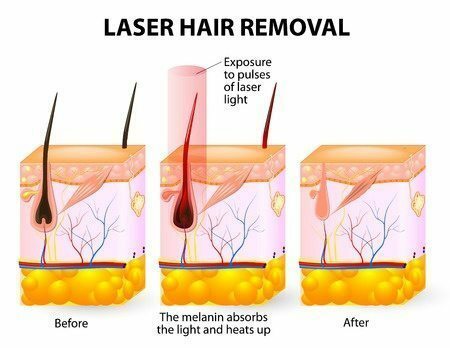 The laser works by heating the melanin to a high temperature in an attempt to damage the cells that cause the hair to grow. This process involves something called selective photo heating. It utilises a specific wavelength of light, therefore preventing damage to the surrounding cells. The pulses between shots of light are an important part of IPL laser hair removal treatment. IPL stands for Intense Pulsed Light. Thus allowing the surrounding area to cool down, which aids the prevention of damage to the skin. Simply, we are manipulating the hair’s characteristics to cause a reduction in hair production. Unwanted hair causes low self-esteem, a reduction in confidence and embarrassment. IPL Laser Hair Removal is an effective and efficient solution. It is best if you come and see us for a free consultation, where we can offer you help and advice on the best treatment for you. Chiefly, you are not under treatment obligation at any point. During the consultation, we fully describe how the treatment works, assess medical suitability and if there are no reasons to not go ahead, then we offer you a patch test. This test is crucial, to allow safe selection of optimal settings for treating you. Finally, you will need to give us fully informed consent before the treatment is carried out. Normally, the IPL Laser hair removal treatment begins with trimming unneccesary hair (if applicable) and cleansing the skin. Spreading a thin layer of ECG (Electrical Conductivity Gel) over the skin is neccessary, to assist the penetration of the pure white light through to the hair root. Interestingley, applying the same ECG gel is essential during ultrasound scans to facillitate penetration of sound, thus producing an image. Your therapist will select optimal safe settings, basing their choice on various factors; medically assessing your immune system response and inherant susceptibilities. Via a quartz conductor, laser light emmission targets the treatment area. This is a single shot of light, at the correct wavelength specific to you. During a patch test session, administering multiple levels may be neccessary in order to find the most effective and safe setting for you. You will be required to communicate the sensation felt at the administration of each of the shots. The level of pain felt is different for everybody. Some clients associate the sensation to a tolerable pin prick but others find it quite uncomfortable and painful. This, however, cannot be predicted so the best thing to do is to give it a try. Once you are happy to proceed with treatment, you can arrange a suitable appointment, 5 days after your initial consultation. This gives you that little bit of time to fully consider everything and ensure the setting selected is safe. Your first treatment will be carried out in the same manner as your patch test and you will be advised on the recommended time interval for your next session. After the first treatment you should notice a difference in the rate, thickness or density of the hair and this will vary from person to person. Note also that you may only notice a difference in one of the factors mentioned and not all three at the same time. This is perfectly normal at this stage. We are always available via phone, text or email if you have any questions. The laser is placed over the area to be treated and a shot of light is emitted at the correct wavelength specific to you. Laser hair removal treatment intervals can vary depending on various factors; this can include the target area and the hair growth rate. The number of treatments needed can also vary depending on an individual’s ethnicity, immune system and stress levels. Also, internal and external biological environments, and the time between each treatment can influnce treatment efficiency. Due to this, we will keep you fully informed throughout the treatment process. We will discuss with you our expectations on how long the treatment may be necessary. IPL Laser hair removal at Clear Medical is about taking care, knowledge and experience. We always have the client’s best interests in mind. Therefore, our clients are always pleased with the quality of the treatments they receive. Above all they are impressed with the amount of time and effort they save in the long run! We hope we can help you eradicate your unwanted hair, whether that means a simple reduction or complete elimination. We care about you and we want you to be able to have the time to enjoy life. Our aim is that you do not have the worry of regular hair removal, and even worse, skin irritation.